These may not be quite as clear as those used on other pages, but are still well worth looking at. A view of the town from the end of the newer longer muelle. Tracks can be seen below the photographer. The 'mainline' ran along the street fronting the water's edge. 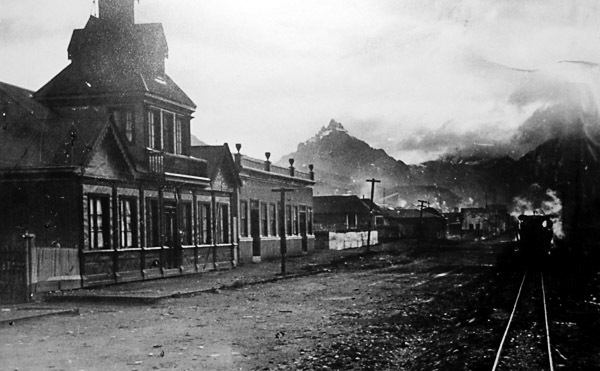 A photo looking eastward along the main street. There seems to be a locomotive steaming gently in the gloom on the right. Calle Maipú looking west this time, in the snow. The track is visible left. 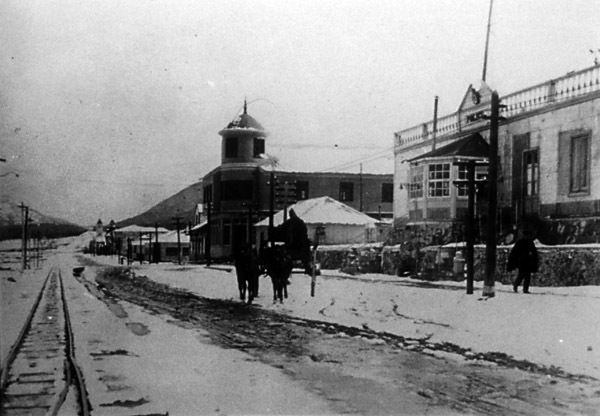 The buildings suggest that this is a much later photo than the one above. Another late photo looking west. 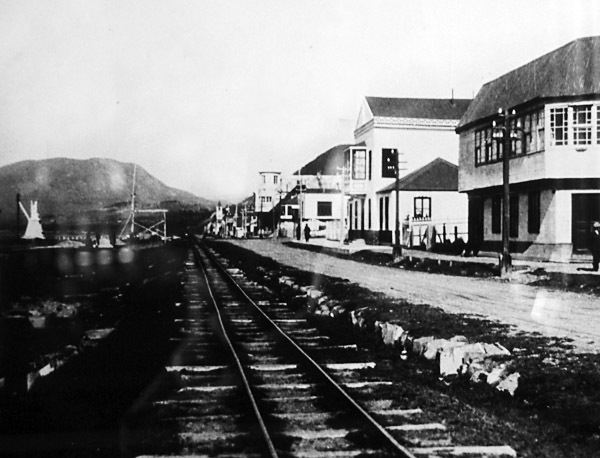 This one was probably taken shortly before the line closed in 1952. A recently discovered postcard showing one of the small O&K 0-6-0Ts with a train of empty wagons in the snow. 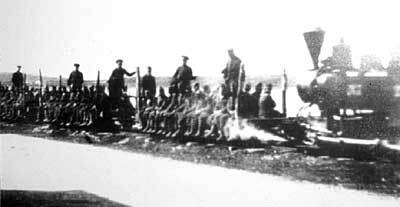 A train of prisoners heads west to the forests. 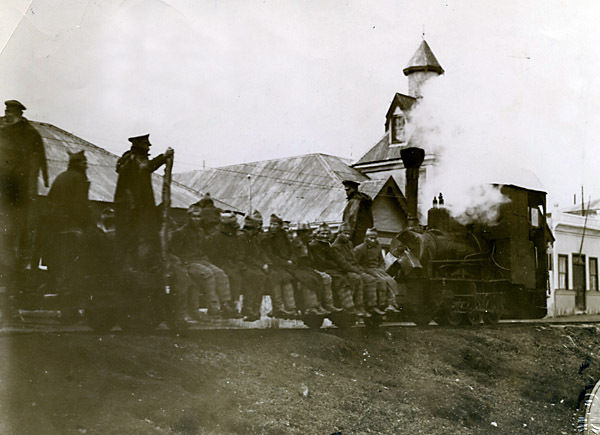 The warders, who worked closely with the individual prisoners, travelled on the wagons with their charges. The guards on the other hand were armed and in black uniforms. They rode on the two rearmost wagons in case of an escape. 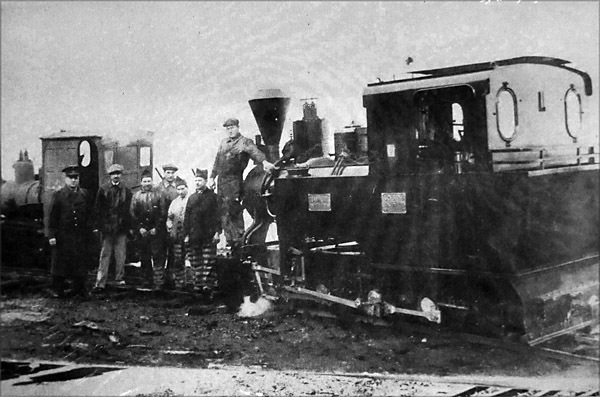 Note the locomotive facing east, not the only one with the Jung 0-8-0T facing that way but other photos show engines facing out west. 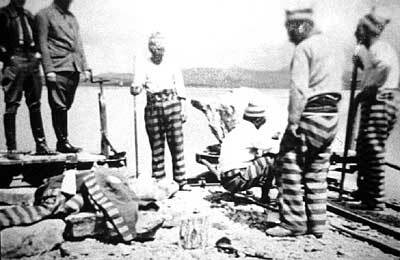 Prisoners at work on the muelle. 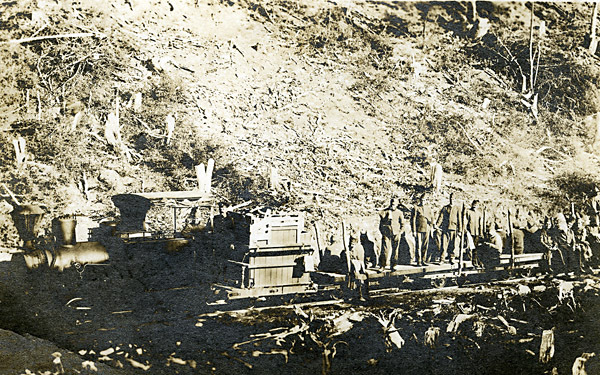 A couple of skip chassis, probably used to bring in the stone, are in the background. The way through the woods. Although the picture is unclear a couple of men can be made out and a bonfire on the left. The sleepers appear to be just round tree trunks unsawn. 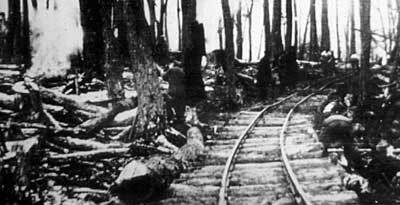 Another section of track in the woods. 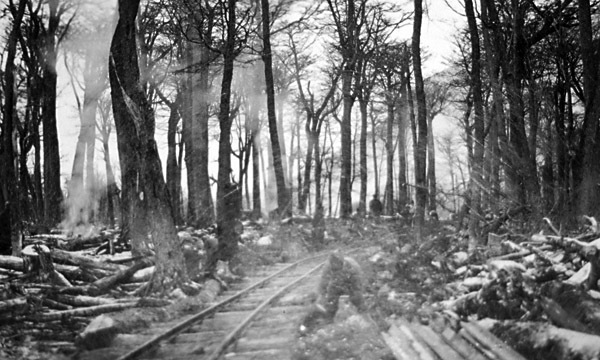 This one has sawn sleepers and the route has been more thoroughly cleared, perhaps indicating that this line was to be more permanent. 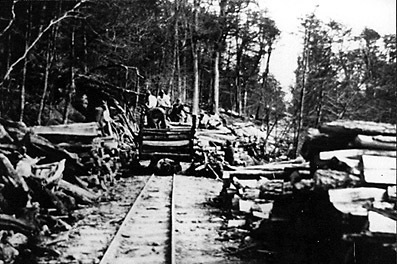 Loading one of the big bogie timber wagons. This looks like a main loading point. Another fairly temporary-looking track in the depths of the forest. 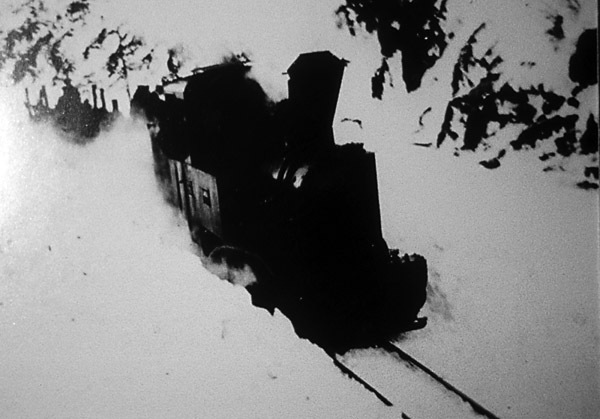 The 0-8-0T sends the snow flying. 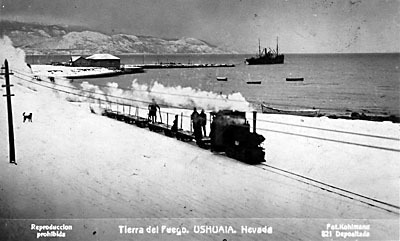 One of the O&K 0-6-0Ts takes a train east along the main street of Ushuaia back towards the prison. A clearly posed photo with a very clean looking later pattern O&K 0-6-0T. 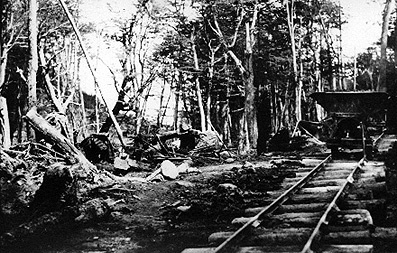 A sepia print of an early pattern 0-6-0T out in the forest. 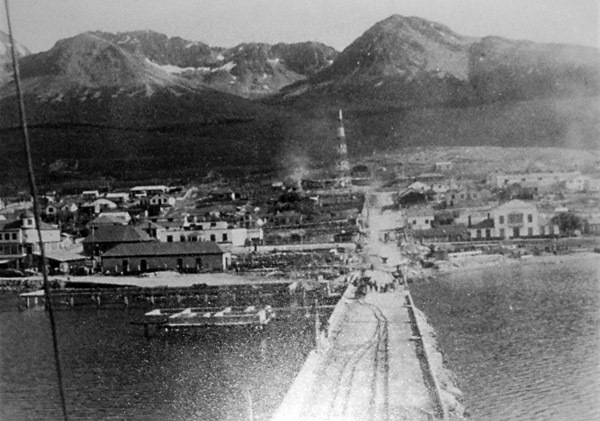 About the time of the closure Ushuaia suffered severe flooding at snowmelt time. 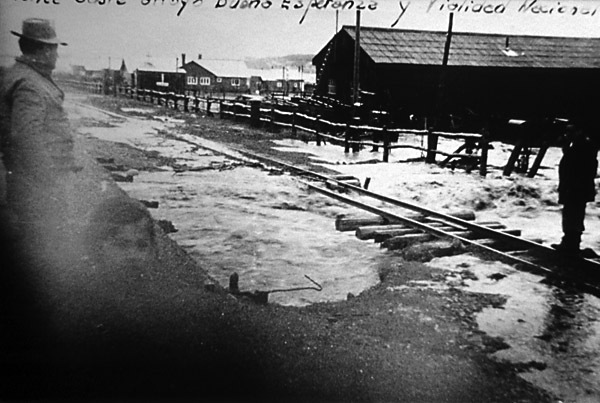 This shot shows a washout under the track in the town. Water is rushing from left to right under the exposed sleepers. 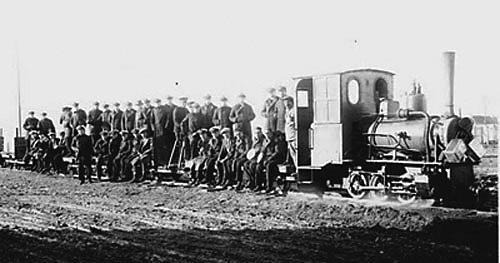 The only known picture showing two locos together. The left hand one is one of the later pattern O&Ks, whilst the right hand loco is the Jung 0-8-0T. 1 From Facebook, Horacio Zentner (27/6/16, no longer available).